I want to make a quilt! What do I need? 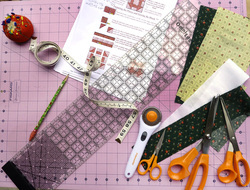 Some general recommendations and suggestions for essential tools to start quilting. See our list of suppliers for where to find most of these items locally. Join Chino Valley Quilters, and enjoy special discounts. You need only the desire to learn and to create beautiful things. Oh, and you may want to practice sewing a 1/4-in. straight-line stitch. Simple! You will need a reliable working machine with a few extra stitches. Look for one that allows you to easily determine a 1/4-in. seam (most often used margin) and you probably will want to purchase a 1/4-in.-seam foot and a "walking" foot if your machine does not have one built in. The walking foot is very helpful for feeding the material when you are adding the quilting stitches. Later on, you may want to invest (and I do mean invest) in one of the newer machines with lots of extras like a needle threader, start/stop sewing button, a needle up/down button, speed control and more special features. This should be 18 by 24 in. or larger. Get one with measurements on both sides and that says "healing." The cuts from rotary cutters will not leave a deep cut; they seem to heal somewhat. Any well-known brand will be fine. Just try out different types of grip and see which one is most comfortable to your hand. You will be pressing down somewhat. I would start with a 45 or 60 mm. One at least 60 in. and maybe a smaller retractable one to carry with you when shopping or traveling. So many choices here but we would suggest a large (23 by 4 in.) with a removable stabilizer edge. You might also consider a medium-to-large, square ruler, which is very handy when you need to square up one of your blocks. Generally, you will start with all-cotton thread. Research thread types and their uses. Again, there are so many choices in thread that you may want to ask your quilting friends what they use for various projects and fabric. Generally, 44- or 45-in.-wide, 100-percent cotton fabrics are used in quilts. There are lots of them in the marketplace; just get a good one that is comfortable to hold. Find a good basic quilt-making book from a reputable source such as Better Homes & Gardens, McCall's Quilting or Fons & Porters. Check out our list here. These are a goldmine of information and friendship! Think about joining a quilt guild or finding a quilter's friendship group in your area. Our Tips & Tricks page includes information for all skill levels. But what if you're just beginning, or haven't yet begun? Join Chino Valley Quilters and start quilting with experienced members eager to share their skills and knowledge.